Make your own Pad or Tampo Printing Plates cheaply. Can I make my own Clichés? Yes you can and save yourself a lot of money and time too. CPL offer a high quality Polymer Cliché Making System at just £125+VAT in our package). With our cliché making system, it takes just around 10 minutes to produce a cliché from your laser printed artwork. Depending on the size of the artwork, it is also possible to incorporate several artworks/jobs on to one cliché - this, again could save you time and money. production with our high quality cliché making systems. Our high quality polymer clichés are water washable and therefore no chemicals are used when etching. This makes them highly suitable for home or office use, without any of the dangers associated with chemicals. 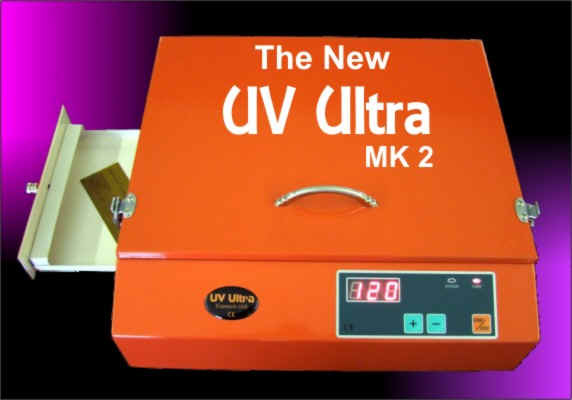 Just look at the UV Ultra's cool features!
. [ Artography Web Design ] .